Bungalow, with sauna, indian canoe, a soapstone fireplace and spacious inside and outside. 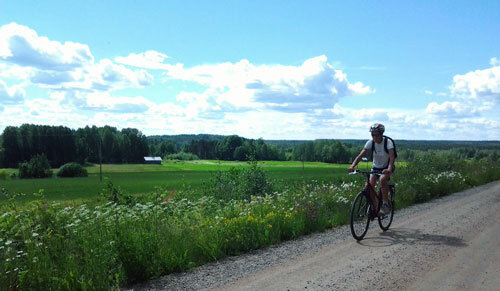 The new built holiday cottage Hirvimäki is situated in the forest near the local road Toijantie. This road leads from Taipalsaari to Vehkataipale. The cottage is built to offer a lot of privacy. There is a parking place and a lawn around the house and 2 ha of forest that belongs to the property. Beside the cottage on the right side there is a clearing in the wood and you find a great variety of mosses. It takes decades for nature to cover the rock with this rich vegetation. Enjoy the beauty of this spot and please be careful about it and do not walk over the mosses and other plants. The holiday cottage is built of thick pine logs and is very well insulated for winter conditions. The house is spacious with a 120 m2 surface downstairs and a nice covered terrace. There is an entrance with in the right wing of the cottage access to changing room with washing machine, shower and sauna. A Finnish holiday cottage is not complete without a sauna. The sauna is electrical heated and free to use. From the sauna and bathroom the veranda is easily accessible. A dive in the lake is also possible. The distance to the lake is about 100m. There is a spacious 14 m2 veranda and it offers the possibility to sit outside protected against wind rain or heat of the sun. In the springtime of 2008 there will be built an outside terrace with permanent barbeque. When it is finished you have the choice to use the terrace or veranda. In the left side of the cottage you enter the spacious living room and open kitchen. The kitchen has a dishwasher, fridge, microwave oven, ceramic hotplate, high quality pots pans and cutlery. In the living room you find the typical Finnish soapstone stove to supply agreeable warmth in wintertime. There is a TV set to watch the Finnish TV channels and also a Game Cube game computer with some games that you can use. Along the living room there is a bedroom with 2 single beds and a large master bedroom with a double bed and a desk. The stairs lead to an open loft were you find 2 single beds. The rooms are warm and comfortable furnished and have wooden floors. The cottage is suitable for a stay in all seasons, also in winter when the temperature can drop to minus 30 C. The house is heated by under floor heating in the whole surface of the downstairs floor. The warmth of the earth is used to heat the under floor heating and warm water supply. The system is called a heat pump system and an environmentally friendly way to heat the cottage. For the drinking water there is a 120 m deep well witch provides water of excellent quality. The heating system has more than enough capacity to keep the house warm in winter time, but if you want to try the soapstone stove it is also possible. The big stove is heated with wood and after a few hours burning the massive stone has accumulated the heat and starts radiating the warmth. This is a slow process and it takes 48 hours for the soapstone stove to cool down completely. Using the soapstone stove correctly needs some explanation but the manager of Hostel Mansikka will help you if you want to use it. When you step outside the cottage you're in the Finnish woodland. On the backside of the house a path leads to the waterfront where you find the Indian canoe. In summertime you can use it to discover the lake and little islands. The renting prices and availability can be found under reservations The use of the Indian canoe, sauna and heating and electricity included. Bed linen can be hired at Hostel Mansikka. We are non smokers and want to keep the cottage free of the smell of smoking. If anything is missing or broken, please report to Joris of Hostel Mansikka. The house was built for 6 persons, but it is spacious enough to make one or two extra beds, ask Joris for the conditions. If you want to make a reservation, you can email or telephone call and we inform you if the house is vacant at the time you want it. The reservation is definitive when 50% of the rent is on our bank account. If you watch the map of the Taipalsaari region the main colour is blue of the many lakes. The lake is always nearby. The extensive lakes are alternated by many islands and land sometimes connected to each other with narrow strips of rocky land. The holiday cottage Hirvim�ki is situated 100 m from the waterfront. In the direct surrounding there is the quietness of the forest and nature. 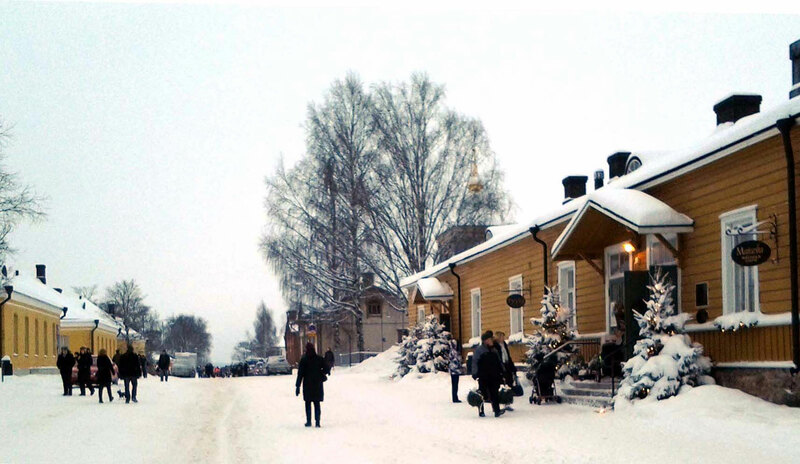 The village Saimaanharju is on 6 km distance and has a supermarket and a cash point. About 17 km to the east there is the town Lappeenranta with a nice marina and many shopping facilities. Seal ( Phoca Hispana ). 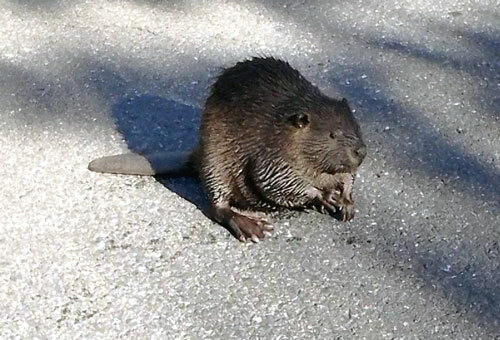 The species live only in the lake Saimaa there are not more than 270 of these animals left and very protected. 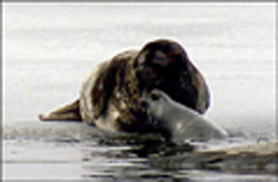 This seal is often used as a symbol of the Saimaa region. The water of the lakes are full of fish, pike, perch and roach are the most common species. Well known are the stories about the mosquito plague in Finland. A fact is that it isn't as bad as the story tells. The country has a rich variety of insects, many of them biting. It is wise to be aware of it and be prepared especially if you go into the forests. The Great Saimaa lake is only a few hundred metres away but to reach the Great Saimaa from this place by boat it is a rather long distance sailing. 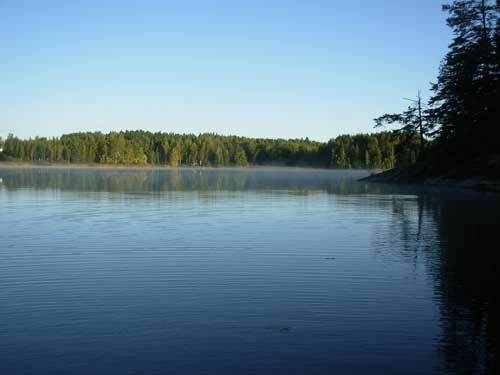 There is a natural dam between this lake and the Great Saimaa lake. This landscape is the result of the Ice Age that formed the hills and lakes. The residents of Taipalsaari are proud of their town hall and it�s design. The town hall was built in 1989 and designed by Ritta and Kari Ojala who made it look like the old tar vessels that used to be so important for Taipalsaari. On the right picture a view from the town hall. On the map above you can find the location of the holiday cottage. 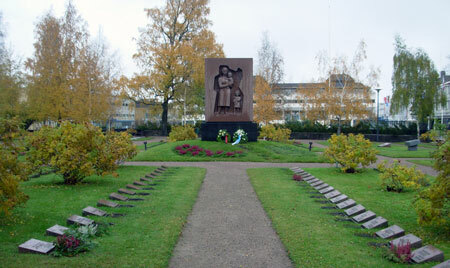 Lappeenranta is the nearest town with 59 000 inhabitants and is situated on the south side of the Saimaa Lake. The literal meaning of Lappeenranta is beach of "savage man" and the coat of arms of the town shows a savage looking man with a club in his hand. During the winter months Linnoitus is a quiet place, Linnoitus is a fortified hill close to the centre of Lappeenranta. But along with the sun Spring returns joy and happiness to Finland. In springtime and summer Linnoitus is more crowded with people talking eating and visiting museums again. From the hill you can see the marina with vessels sailing in and out of the marina. From the 15th of June Lappeenranta has yet another attraction, the sandcastle, it is build every year. This years theme is: fairytales. Visiting the sandcastle is free and surprising every year again. Some other attractions in Linnoitus are the cavalry museum and the South Karelian Museum. The oldest orthodox church (built in 1785) in Finland is a nice place to visit too, it is a small church but loaded with precious religious art. Keep in mind though that you should wear proper clothing otherwise you won't be able to go inside the building. The picture beneath is taken in the café next to the church called Majurska Kahvia.Beside the city centre is a huge paper factory called Kaukas. Day and night trains and lorries transport tree trunks to the factory to produce paper, one of the export products of Finland. On the outskirts of the town a lot of big shops have been built the last years. More and bigger than could be expected in a town of this size. If you walk there the language you hear is often Russian. The border crossing is nearby and the Russians have discovered that a lot of goods are available in Lappeenranta that are not for sale in Russia. The big number of Russian customers brings economic prosperity to Lappeenranta. Many supermarkets are real mega stores for example the Prisma supermarket, near the airport is worth visiting to buy some oatmeal, Finns eat oatmeal porridge every morning. The city centre has lost its importance as shopping centre, but an effort is made to make the centre more attractive again. There is a lot of building for new shops and parking facilities, and next year it will be finished and the result will bring more visitors to the heart of the town. The most attractive part of Lappeenranta is found in the harbour area ( satama ) and the Fortress of Lappeenranta ( Linnoitus ). The Fort is an old garrison and a collection of interesting buildings on a hill along the marina. Interesting details can be found on the site of Lappeenranta. North of the town is the territory of the Saimaa lake in connection with Puruvesi Lake and Haukivesi Lake. In the centre of these lakes as a crossing of waterways you find the most beautiful town of Karelia: Savonlinna. The road from Lappeenranta to Savonlinna leads over Punkaharju, a spectacular road over a neck of land with lakes and islands on both sides with beautiful views on the Finnish landscape. The road brings you to Savonlinna a town of strategic importance. A huge castle was built here and nowadays it still dominates the skyline of Savonlinna. From all sides the towers of the castle can be seen. The castle is called Olavinlinna and can be visited. In a guided tour you learn a lot about the history of the castle and of the history of Finland as the frontline between the Swedish in the West and the Russians in the east. In summer the castle Olavinlinna is the scenery of the Savonlinna Opera Festival witch is one of the important opera events in the world. 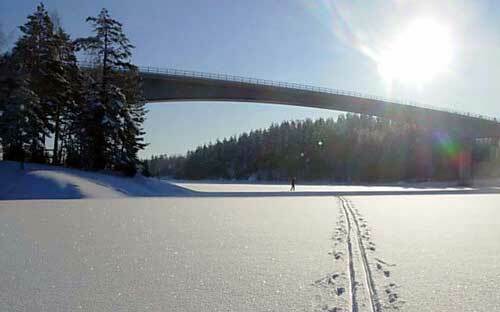 The area between Savonlinna and Lappeenranta invites the lover of nature for hiking, biking or canoeing and our holiday cottage can be a perfect starting point. Since the 16th and 17th century plans existed to connect the Saimaa lake with open sea. The possibility to transport wood and other goods by ship to the sea would be a very important economic impulse for the region. The extensive system of lakes formed a connection of waterways inland but there was not a route to the sea. 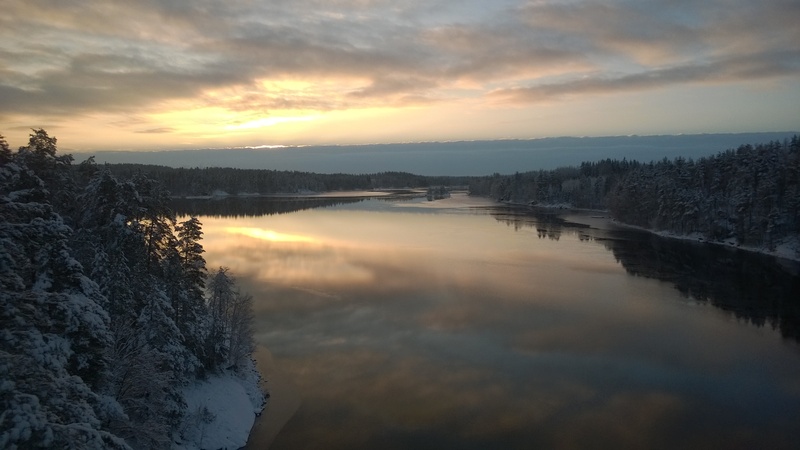 In 1812 started a political debate about building a canal to connect the lake Saimaa with the sea. Finally the building started in 1845 and was completed in 1856. The project was considered as the most important hydraulic engineering project of that time and the costs were bigger than the total year budget of the duchy. 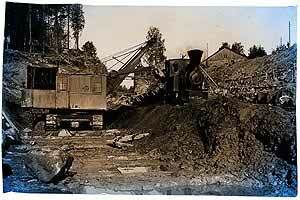 The canal was a success and the intensive traffic stimulated the economic prosperity of east Finland. The building costs were recovered in less than 25 years. The canal appeared too small and the decision was made to enlarge the waterway to make the use of larger ships possible. A reconstruction started in 1929 but was not completed due to the outbreak of the winter war of 1939. Five of the eight locks were completed. Originally the canal was built on Finnish territory but after the Second World War Finland had to give up territory to the Soviet Union and an important part of the canal was on the Soviet side of the new border. The negotiations with the Russians to finish the project were difficult. At last, thanks to skill of the popular president Kekkonen there was an agreement to restart the building project. The plans of 1929 turned out to be out of date. The capacity of the canal should be bigger and a total reconstruction was completed in 1968. 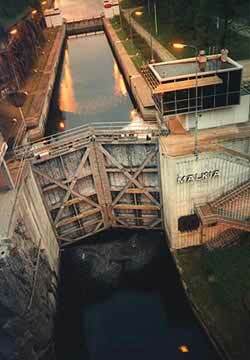 Yearly 1,5 million tons of goods are transported over the canal. From Lappeenranta to the Gulf of Finland 8 locks are passed through, 4 on Russian territory. Maintenance of locks and canal is done by the Finnish government. 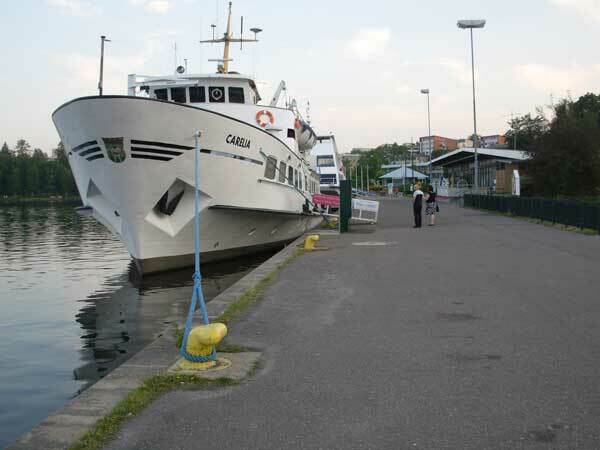 In the marina of Lappeenranta you find ships for a cruise over the canal and even a visit to Vyborg. For a visit to Russia you need a visa.